Recent policy and legislative changes from Washington, D.C., and state houses around the country have only added to the uncertainty in the healthcare world. Among bureaucrats, high-level discussions and backroom deals affect weighty topics like Medicaid expansion, the opioid crisis, and the legacy of Obamacare. These are huge conversations with global implications. But they also have a big impact on whether your doctors or nurses get home safely after their shift ends. The U.S. Department of Labor reports that healthcare workers report over 11,000 assaults/year. Healthcare workers account for a staggering 75% of victims of workplace violence in the U.S. Other statistics show violence levels have crept upward over the past few years. Much of this violence is caused by patients who act out because of psychological conditions. A heightened security presence is needed when prisoners or inmates require medical care. Sometimes a visitor becomes agitated in the wake of bad news, and they respond violently. Less frequently, severe weather threatens the building itself, not to mention the people inside. Hospitals should be oases of care and respite for the sick. Yet in situations like these, staff and visitors alike are put in danger. Security is a critical need. Any business tries to limit its overhead costs — that’s a no-brainer. Healthcare providers today find themselves in a cutthroat marketplace. With razor-thin profit margins threatened by insurance and budget cutbacks, hospitals across the nation are feeling the squeeze. Security offices are no exception. Hospitals and clinics are aiming to reduce overhead costs wherever they can. In many places, security effectiveness is measured down to the square foot. The analysis often results in cost-saving staffing cuts that reduce peace of mind for everyone at the hospital. 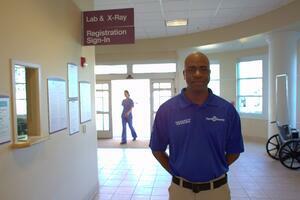 Hospitals across the nation are partnering with Signal 88 Security franchises to “outsource” their security needs. Because each Signal 88 franchise is independently operated, local owners can tailor services to the exact needs of the client. That local touch means officers can be trained on HIPAA regulations, hospital security protocols, and other healthcare-specific details. Signal 88 officers can join seamlessly with your security team, providing extra manpower when needed. Yet the hospital isn’t responsible for any of the payroll, taxes, or HR resources. By partnering with Signal 88 to handle security, hospitals can take advantage of Signal 88’s competitive prices and great service while leaving the overhead and administrative work to us. In the end, the hospital will be a more peaceful place for doctors, patients, and visitors alike. To get in touch with your local Signal 88 franchise, click here.